Shown here is a close up of the central pattern, a view of the Tower of London. 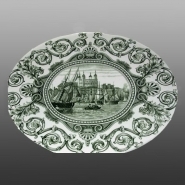 An earthenware tureen stand printed in green in a pattern named Tower of London (see the second printed mark). The "New Blanche" mark referred to the factory's earthenware with a distinct white color.